OK, pet lovers. Time to, uh, paws for a second and consider what's flying into Chicago on July 14, just for you and your beloved cats and dogs: Pet Airways, a start-up airline devoted to flying pets in comfort. But only pet cats and dogs for now. No parrots or exotic snakes. No human passengers, either. 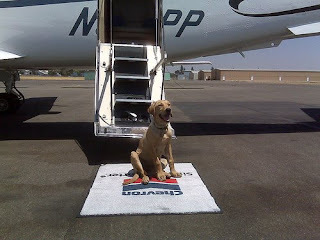 In the planning stages for more than a year, Pet Airways initially will fly between Chicago and four other markets -- New York, Los Angeles, Denver and Washington, D.C./Baltimore -- in a single 19-passenger commuter jet that has been re-outfitted to accommodate up to 50 "pawsengers" -- and one pet attendant -- in the main cabin, not the cargo hold, on each flight. The introductory one-way fare between any two cities is $149 each way. Pet Airways has taken pains to ensure its pet passengers will be treated with all the tender loving care their owners would expect. Among other things, pets booked on Pet Airways are dropped off and picked up at dedicated pet lounges at each airport served, which in Chicago will be the Palwaukee/Chicago Executive Airport northwest of the city. Pets are given potty breaks immediately before and after each flight, and the pet attendant monitors them every 15 minutes during flights, which will be at night, when pets are more relaxed, said Pet Airways spokeswoman Alysa Binder. Will the all-pet airline concept fly in a tough economy? The carrier's investors are starting cautiously, with only one eastbound flight and one westbound flight from each market every week.